Villa Pasha with its sumptuous five bedrooms, spacious layout and extensive grounds, feels more like a stately home than a holiday villa. The luxury stone-built villa. Villa Pasha with its sumptuous five bedrooms, spacious layout and extensive grounds, feels more like a stately home than a holiday villa. The luxury stone-built villa, in the mountain village of Dagbelen, Bodrum near Turkey's southwest coast, is set in peaceful and private surrounds, enjoying breath-taking views of a picturesque valley with the blue Aegean Sea backdrop in harmony with the horizon. Strolling down the cypress-studded driveway which starts from an ancient water reservoir, you're greeted by the impressive main entrance of the villa. At the front, there's a pebble garden, dotted with islands of cacti, crepe myrtle and Erythrina, while at the back you'll find a soft grassy lawn, the sun lounger lined infinity pool and a surrounding well-kept lush landscape of natural rock outcrop and colourful plants and flowers including pink bougainvillaea, gazanias and succulents. The two verandas provide shelter from the sun, and there's plenty of places to put your feet up. Inside, the villa is decorated in warming colours of browns and reds and features decadent English and French pieces, as well as traditional patterned Turkish carpets and abstract paintings. The living room, dining room and kitchen are grand with an oak dining table and more antique furnishings. Perfect for entertaining or eating in, the traditional Tuscan kitchen has everything you may need. 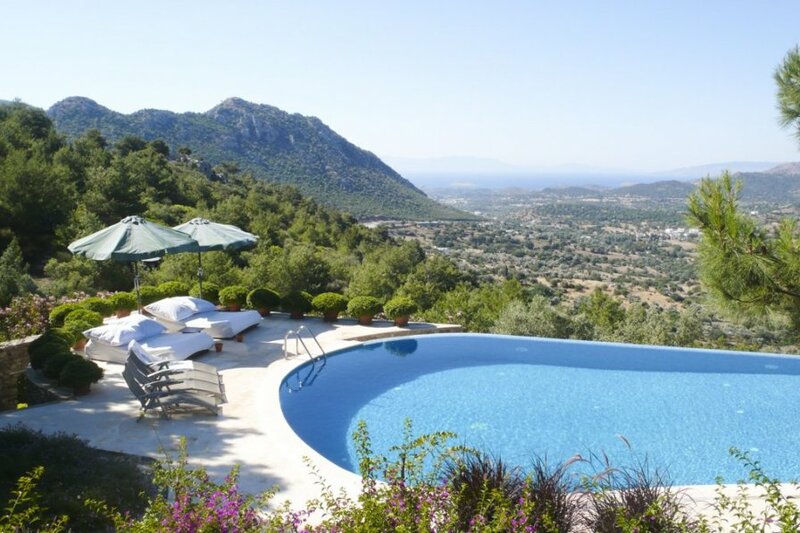 Villa Pasha is ideally located in the mountain village of Dagbelen in Yalikavak, Turkey. With its beautiful natural surrounds, it's a popular place with walkers and hikers, and the pine forest and peak to the north pose a dramatic backdrop to the village. Dagbelen is 8km south of Yalikavak, known for its marina and beaches, including Yalikavak Beach. There you'll also find local shops and supermarkets for picking up fresh produce, and top restaurants and cafes for dining out. Near to Yalikavak is the Kudur Peninsula with spectacular rock caves, offering views of the coastline. The hills outside Yalikavak are also worth exploring with a group of old stone windmills. From Yalikavak, it's a 30-minute drive to the centre of Bodrum. The vibrant city boasts everything from a beautiful marine to ancient sites and boutique shops. If you're looking for a traditional shopping experience, you can visit Bodrum's farmer markets. Stalls that sell everything from fresh produce to hand-made rugs and clothing are also set up in different hamlets of the peninsula, each day of the week. When the sun sets, the city comes alive with live music, and there is an abundance of restaurants, bars and clubs. For a dose of history and culture, the most prominent ancient site in Bodrum is the castle of St. Peter, dating back to the Knights of St. John. The theatre is also worth a visit. It's located in the hillside overlooking the city and was built during the Hellenistic age. For sports lovers, there's an 18-hole golf course in Yakakoy valley, as well as tennis courts dotted around the peninsula and plenty of opportunities to take part in water sports like sea kayaking, scuba diving and parasailing.